can be stored away for storage very easily. This picture shows the complete installation. The antenna is only about 2' above the camper roof. The antenna mast I found at a yard sale. It was 2' pieces of interlocking 1 1/2" pipe. You can purchase 5' pieces at Radio Shack and you will need only 2 pieces. Purchase a small antenna that once it is folded up you can store it with in the camper. This picture shows how to mount the mast on your roof support. What did we do before velcro came on the market ?? This shows the block of 2x4 wood I made to fit the roof support and antenna mast. The velcro, I found in some of my junk just laying around. Any type of velcro will work. This will allow you to easily install and take down the antenna. This is the upper support holder. This is how I made the the 2x4 support. It is only about 6" long and you cut out to fit your roof support and also the antenna mast on the other side. 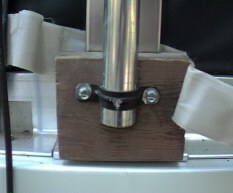 The velcro is then attached to the support. This shows the bottom support. This remains to be attached to the antenna mast by using a "c" clamp. 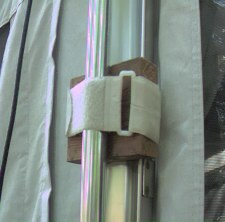 The "c" clamp prevents the mast from dropping down on to the camper body. 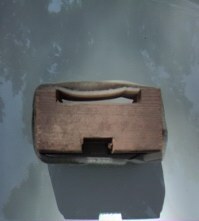 connector into the camper body. Have received lots of e-mail from this project! One e-mail came from Kevin McClure, Atlanta, Ga.
ground so there is less stress on the camper. to turn the antenna, I call it the "Armstrong Rotator"
Great E-mail Kevin and thanks for sharing your idea !